Yes, we know, not every state is home to a mountain, so when we say “tallest mountain”, we mean it in the loosest way possible. In some states, “mountain” actually means “hill” and in others it means “plain”. The amazing geographical diversity of America is apparent just by looking at the behemoth Denali Mountain in Alaska next to the bump that is Nebraska’s Panorama Point. Check out our list of the highest natural points in each state and let us know in comments which ones you’ve visited! Interesting Fact: The Cheaha Mountain gets its name from the Creek Indian word “chaha”, which means “high place”. Interesting Fact: A part of the San Francisco Peaks that circle a now quiet volcano. Interesting Fact: One of the easier state high points to reach the top of, Signal Hill is the higher of two peaks that make up Mount Magazine. Interesting Fact: Mount Whitney is the tallest mountain in the contiguous United States. While you don’t need any technical mountain climbing expertise to reach the summit, you do need a permit. Interesting Fact: Mount Elbert is the highest summit of the Rocky Mountains. Interesting Fact: Summit of Mount Frissell isn’t located in Connecticut, it’s in Massachusetts. But, that doesn’t mean it’s the high point of MA. Interesting Fact: The second-lowest state highpoint (behind Britton Hill in Florida). Interesting Fact: As the lowest state highpoint, Britton Hill is a popular ironic tourism destination for mountain climbers. Interesting Fact: On clear days, you can see four states without using telescopes. Interesting Fact: One of the only places in the world where you can drive from sea level to 14,000 feet in around two hours. Interesting Fact: The standard route, named Chickenout Ridge, is a common turn-around point for many climbers, while being a breeze for experienced climbers. Interesting Fact: Charles Mound is located on private farmland, and can only be publicly accessed on the first full weekends of June, July, August, and September. Interesting Fact: Hoosier Hill’s designation as the highpoint of Indiana is being threatened by a nearby landfill that may have garbage stacked at a higher elevation. Interesting Fact: There are signposts pointing signaling the directions and distances to the 49 other highpoints. 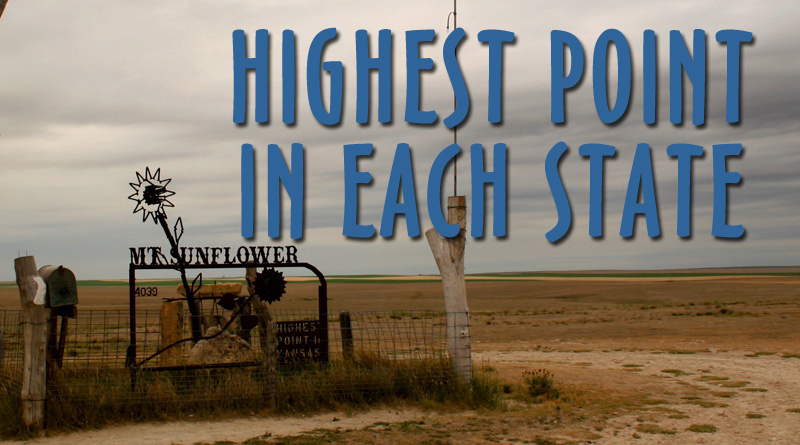 Interesting Fact: The highest point in Kansas is the lowest point in Colorado, which is but a 10 minute walk from Mount Sunflower. Interesting Fact: At the summit of Black Mountain is a large energy tower, making the highpoint appear to be more of a construction site than a tourist spot. Interesting Facts: Driskill Mountain is the third-lowest high point (behind Delaware and Florida). It was named after one of the area’s first settlers. Interesting Fact: As the northernmost end of the Appalachian Trail, many thru-hikers celebrate their 2,000-mile trek at the summit. Interesting Fact: Hoye-Crest is so close to West Virginia that the closest entry point to the highpoint is not in Maryland. Interesting Fact: Mount Arvon is not technically a mountain. According to geologists, a mountain is anything 2,000 feet or more above sea level. Interesting Fact: A four-hour hike to the top will give you a panoramic view of the boundary waters and into Canada. Interesting Fact: Woodall Mountain (basically a hill) was the location of a Union artillery unit during the Civil War. Interesting Fact: After you summit Missouri’s high point, you can visit Mina Sauk Falls, the state’s tallest waterfall. Interesting Fact: Although it’s the 10th highest point in the US, it’s the second most difficult highpoint to reach (behind Denali). Region: Southwest near the Wyoming and Colorado borders. Interesting Fact: Panorama Point is neither a mountain nor a hill, but a rise in the High Plains. In the west you can see Rocky Mountains in the distance. Interesting Fact: Boundary Peak is only a half mile from California. Many climbers will start their climb in Nevada, reach the top, and then cross the border using the ridge to Montgomery Peak. Interesting Fact: The Mount Washington Observatory is a leading nonprofit and educational institution focused on advancing our understanding of weather and climate. Interesting Fact: At the peak is High Point Monument, a war memorial built in 1930. Interesting Fact: A carefully constructed path makes Wheeler Peak one of the easier mountainous highpoints to reach. Interesting Fact: Mount Marcy lies in the heart of the Adirondacks, and is a popular spot for hikers in the summer. Interesting Fact: Mount Mitchell is the highest peak of the Appalachian Mountains, as well as the highest in eastern mainland US. Interesting Fact: White Butte may be the only highpoint to charge admission. Visitors are encouraged to pay $5 since it resides on private property. Interesting Fact: Located on the campus of a school, Campbell Hill is one of the most well-maintained and accessible state highpoints. Interesting Fact: Not only the highpoint in Oklahoma, Black Mesa is also the driest and coldest spot in the state. Interesting Fact: Mount Hood is considered dormant but “potentially active” due the odds of it erupting in the next 30 years is 3-7 percent. Interesting Fact: You can climb to the top of an observation tower, but the real highpoint is a nearby boulder with a small circular marker on it. Interesting Fact: Access to the Jerimoth Hill highpoint had been prohibited for years, because part of the path crossed a private driveway. Interesting Fact: Sassafras Mountain is one of the easiest highpoints to summit. You can drive most of the way in your car. Interesting Fact: Black Elk Peak’s named was changed from Harney Peak in 2016. Black Elk is a well-known Lakota medicine man, while US General Harney is most known for a massacre of Sioux women and children. Interesting Fact: A 45-foot observation tower offers a 360-degree panorama view of the area surrounding Clingman’s Dome. Interesting Fact: The summit of Guadalupe Peak is marked with a stainless steel pyramid erected to commemorate the anniversary of the Butterfield Overland Mail, a stagecoach route. Interesting Fact: King’s Peak is considered the most difficult mountain to climb without special training. The easiest path is 29 miles round trip. Interesting Fact: When viewed from the west or the east, an elongated horizontal face silhouette can be seen with a forehead, nose, lips, chin, and Adam’s apple. Interesting Fact: The Appalachian Trail crosses within a half mile of the summit of Mount Rogers, making it a popular hiking destination. Interesting Fact: Mount Rainier is an active stratovolcano, and is considered one of the most dangerous in the world. Interesting Fact: Along with the highest elevation in West Virginia, the Spruce Knob Mountain Center has 400 acres of forestry, natural springs and caves. Interesting Fact: You can climb the observation tower for a 30-mile sight of the surrounding scenic park. Interesting Fact: At 896 acres, Gannett Glacier is the largest single glacier in the Rocky Mountains.